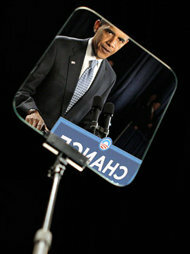 Home » World » USA & Canada » Obama’s Teleprompters are stolen! This must be the weirdest news. Looks like somebody is not happy with President Obama using teleprompters during all his speeches. A truck carrying thousands of dollars worth of equipment that travels with Obama was stolen. Even the President’s belongings is not protected in America. A local NBC affiliate in Richmond, Virginia reports that thieves stole a truck carrying hundreds of thousands of dollars worth of equipment that travels with President Obama, including his Teleprompters. Thieves saw the truck carrying that equipment and couldn’t resist the target. We’re told the truck was parked at the Virginia Center Commons Courtyard Marriott in advance on Wednesday’s presidential visit to Chesterfield. Sources said inside that vehicle was about $200,000 worth of sound equipment, several podiums and presidential seals, behind which only the President himself can stand. They told NBC12 around 12:30 Monday afternoon that truck was recovered in the parking lot of the Holiday Inn Express near the airport and hotel staff confirm police activity.